Release of stock trading ebook postponed. 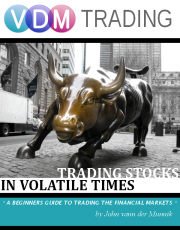 Today was the day when my new ebook: VDM Trading: Trading in Volatile Times was supposed to be released. After further consideration and collaboration with a professional ebook writing company, I decided to postpone the release date. Reason for this is that I want the ebook (which going to be over 200 pages) to be more extensive. It already covers some in depth topic about the financial markets, but there is a lot more that can be done to make this ebook an exceptionally valuable resource for all traders. A further date has not been set yet, but I will do so within a week or so. I do not expect it to be any longer than over a month until it's actually released. It going to be hard work to get everything well formulated. For those who pre-ordered the ebook will get a refund and will still get the ebook once it's released!